Although Nikki Vradenburg is the only K-1 teacher in her Bozeman, Montana-based school, her personal learning network includes fellow educators from across the region, country and globe. "Our state is so spread out that teachers do not often have the opportunity to meet and work with other teachers," said Vradenburg, who has spent 15 years in the classroom. "I use Twitter to share ideas and get information from other K-1 teachers. It keeps me from working on an island." Although Vradenburg has followed educational technology developments her entire career, she was "inspired to try blended learning" approaches after joining Twitter and participating in Twitter chats three years ago. Because of the relationships she forged on chats including #MTEdchat (Montana Educators), #WYOEdchat (Wyoming Educators) and #BPOPchat (the official chat for BrainPOP animated games and educational media), Vradenburg now collaborates and shares digital resources with teachers she otherwise would have never met. As well, whenever Vradenburg attends or presents at industry conferences, she now has already established deep relationships with many of the attendees. "It helps to have people sharing their thoughts and resources during the event in case you can't attend all of the sessions," she said, adding that "the backchannel conversations during the event are almost more interesting than the live presentations." Teachers like Vradenburg who are immersed in the ways of Twitter have no problem leveraging the platform for professional learning. However, none of Twitter's transformational benefits impact teachers who don't know where to begin. "The biggest communication gap with Twitter is the fact that hundreds of thousands of educators still are not connected educators," observes Bryan Miller, co-founder and director of Educational Technology at Edventure Quests who previously served as Director of Educational Technology at Pine Crest School in Fort Lauderdale, Fla.. "It is difficult to gain the attention, or have the conversations with those educators that may feel there aren't others out there like them that can support them." While there are hundreds of regional, topical and age-specific Twitter chats available for Pre-K educators each week, participating in a chat for the very first time can be daunting. This is particularly true for teachers not yet comfortable with the nuances of Twitter. Sean Gaillard, principal at Winston-Salem, N.C.-based John F. Kennedy High School, wants to hold the hand of any educator interested in participating in his popular bi-weekly chat #EdBeat, and let them know that there is a place they can go where everything flows more easily. "I really wanted it to be inclusive and informal," said Gaillard, who started #EdBeat early last year after previously moderating a chat he set up for his former school that began to attract a broader following. #EdBeat is a medley of professional development, positivity and passion. There are also a lot of musical references and lessons derived from The Beatles. "I am always thinking about that lonely teacher in South Dakota that is passionate about flipped classrooms but doesn't really have an avenue (to collaborate)," he said. "That's why I really stress the positive. Anybody can play in the band." In addition to #EdBeat, Gaillard also started the regularly trending #CelebrateMonday movement on Twitter as pushback against "cynicism happening in education". His mission is to encourage teachers, students and administrators to start off the week "with unabashed joy" and radiate everything they are by tweeting positive messages and images associated with that hashtag. On many Sundays, Gaillard co-moderates the #Read4Fun chat with Literacy Specialist, Professor, & Global Program Developer Jennifer Williams. 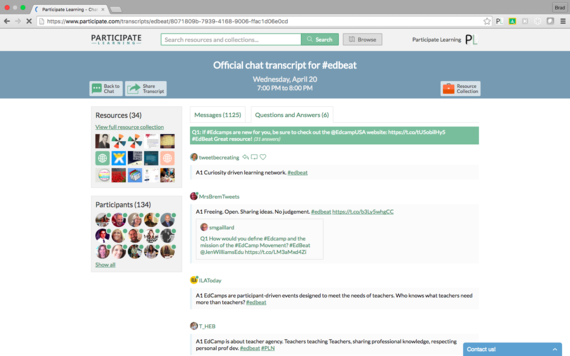 Most weeks, Williams guest moderates any number of popular education chats including #whatisschool, #EdTechChat, #TeacherEdChat, #TnTechChat and #EdBeat. 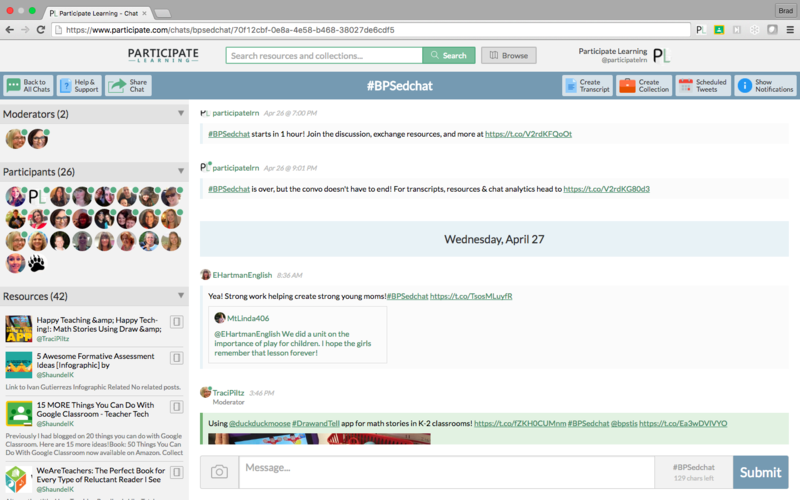 She also moderates chats associated with online conferences, including Global Leaders Week (#globaled16). Social media conversations with "like-minded individuals", says Williams, provide a virtuous combination of personal and professional benefits. "Twitter instantly appealed to me as a professional because I was able to customize my Professional Learning Network," she said. "Within the space, I sought out educators that brought a sincere and genuine voice to the conversation of education. I quickly found that I was able to engage in conversations with like-minded individuals that positively changed me as a teacher and, more as a person. Twitter chats allowed for expanded and focused discussions on topics that were personally significant in my life." Beyond sharing ideas and words of inspiration, Twitter chats are the most effective way for teachers to share and talk about digital resources they are using to broaden their instruction and communicate more proactively with their students, colleagues and administrators. One of the educators that Vradenburg met on Twitter was Billings, Mont.-based kindergarten teacher Traci Piltz. Long before they met in person, Vradenburg helped create a digital version of a book Piltz was hoping to use for the Global Read Aloud project, but could not find a physical copy. Thereafter, the two encouraged their students to write about the book via their respective classroom blogs. More recently, Piltz and Billings-based Technology Integration Specialist Ann Brucker created a hashtag and weekly chat for Billings Public Schools found at #BPESedchat. Earlier this spring, teachers from all over the district - many of which had never been on Twitter before - spent one hour each Tuesday night collaborating and sharing resources via that hashtag. To accommodate the Twitter newbies and engage more experienced users interested in seeing and learning more about all of the resources shared, Pilz and Brucker encouraged the group to use Participate Learning (where I work) as their chat client. 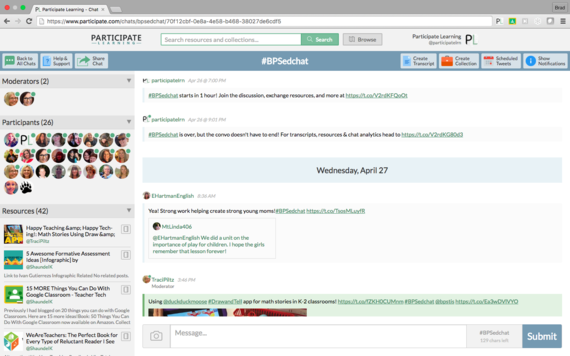 By the second week, more teachers were collaborating within the chat via Participate Learning than Twitter.com, TweetDeck and other clients combined. 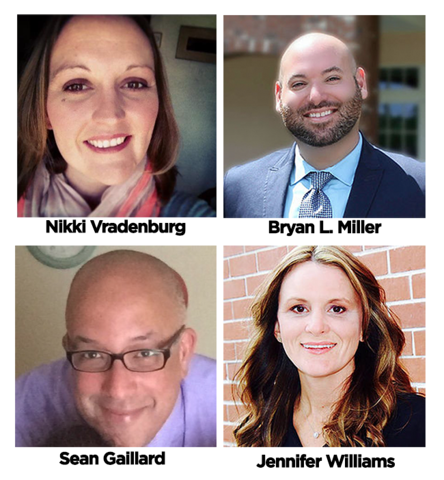 "I needed a really easy entry point for the Twitter newbies who are not only novices when it comes to an edchat, but were often unfamiliar with Twitter at all," wrote Brucker in a blog post last March. "It occurred to me, though, that Participate might just be the ticket because not only is the platform easier and less distracting, but each chat has its own direct link!" 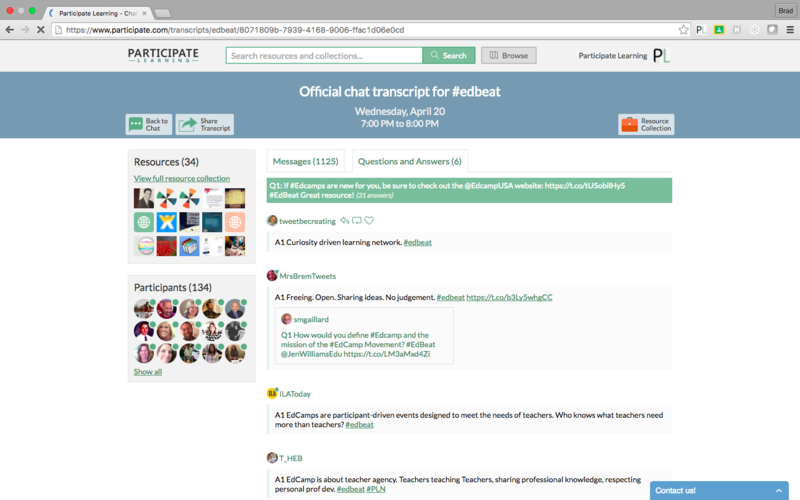 Schools, districts and professional learning communities from across the globe are now using Participate Learning for their chats, as well as to review transcripts and resource collections from previous chats. Social networks continue to evolve and respond to the needs, desires and behaviors of their users. As Gaillard notes, "10 or 12 years ago, it was all about MySpace, and if I were doing #EdBeat or #CelebrateMonday on MySpace we wouldn't be having these kinds of conversations." Gaillard, Vradenberg, Miller, Williams and others regularly use and/or are experimenting with tools like Voxer (virtual walkie-talkie), Remind (student, teacher, parent communication platform), Periscope (live video platform, owned by Twitter), Blab (live video conversations) and Participate Learning to continue and illuminate conversations initially started on Twitter. "Because of the incredible shift in technology," said Gaillard, we have top be open to whatever the next connectivity 3.0 vehicle is." The key is to provide a place for educators to see the meaning of within, but with a little help from their friends.